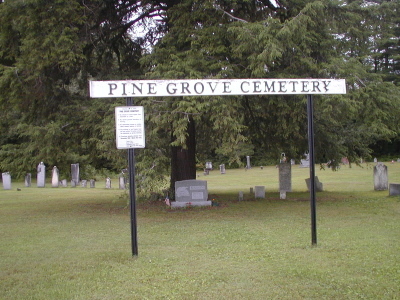 DIRECTIONS: This cemetery is located on the south side of the road between Westville Center and Constable (Route 122), about 1.5 miles from Route 37. 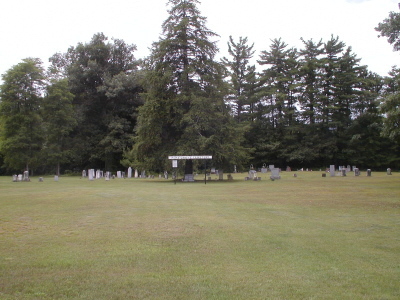 This cemetery is also known as Man Cemetery. The first transcription was by Elizabeth Coleman, Adirondack Chapter D.A. R. who visited the cemetery in 1938. This was located at the Saranac Lake Free Library in Saranac Lake, New York. The second transcription was conducted by Hugh & Woody McLellan on Sept. 2, 1938. Thanks to Wayne Miller, Librarian at Special Collections, SUNY Plattsburgh, Plattsburgh, New York for access to McLellan's Cemetery Collection. The third transcriber was Mrs. Roy Avery of Syracuse, New York who transcribed the cemetery on May 26, 1971. The final transcriber was Virginia A. Wolfe who completed her work in 1983. It appears that she was aware of and used Elizabeth Coleman's work as a reference. Their work is very similar. By consulting the digital photographs. If a decision could not be made, and at least two of the transcriptions matched, the data was assumed to be correct. Unresolved differences are indicated in the transcription. The oldest burial appears to be that of Albon B., Son of Sukey & Albon MAN, who was born Jan. 15, 1807 and died June 18, 1807. Jerome BARTON Died Aug. 23, 1877 Aged 66 Y'rs. & 5 Mos. And was a Christain (sic) as a Christian died. Capt. Thomas CHAMBERLAIN Died Nov. 18, 1838 AE 70 yrs. Sacred to the Memory of Lydia, Wife of Samuel COGGIN, who died Nov. 9th, 1837, aged 37 years 1 month & 21 days. Our Mother Laura BRIGGS Wife of Samuel COGGIN Died Sept. 14, 1887 AE 75 Y'rs. Benjm. Oscar Son of San'l & Lydia COGGIN Died May 27, 1842 In his 15th yr.
G. W. COGGIN Died Mar. 21, 1879 AE 33 Y'rs. will your heart be also. Warren CONSTANTINE Died Dec. 22, 1891 AE 60 Yrs. Marie H. Wife of Warren CONSTANTINE Died Dec. 24, 1891 AE 59 Yrs. Mary Dau. of W. & M. Constantine Died July 10, 1888 AE 14 Yrs. Polley Wife of James Constantine Died Feb. 17, 1886 AE 77 Yrs. Catharine Wife of Gen. David ERWIN Died June 10, 1840 in her 79 year. And mingle with the dust. Allen J. Son of P.A. & Jane ERWIN Died Nov. 15, 1861 AE 32 yrs. & 9 mos. Father Oliver Died April 25, 1886 AE 65 Y'rs. 11 M's. 16 D's. Co. G 142nd N.Y.S. Vol. Mother Samantha Wife of Oliver FARMER Died Nov. 4, 1878 AE 51 Y'rs. 4 M's. 8 D's. Noyes FARMER Died Jan. 11, 1881 AE 21 yrs. Angel's shall watch the dust where he lays. Who for his welfare so often has prayed. George W. Jr. 1845 - 1928 Priv. Co. F. 16 Reg. N.Y. Vol. Cav. Anna B. SHERWIN Wife of Geo. W. GRIFFIN Jr. Died July 15, 1873 AE 26 Y'rs. Olive M. Wife of James J. GRIFFIN Died Dec. 11, 1904 AE 45 Y'rs. Willie S. Died Feb. 5, 1885 AE 3 Y'rs. Nora E. Died Mar. 22, 1895 AE 2 Y'rs. Luella Died Mar. 22, 1898 AE 2 Y'rs. Dafnal Daughter of G. & R. HOLLAND died Nov. 27, 1840 AE 7 Weeks. Guy E. died March 4, 1882 AE 1 Mo. 3 Ds. Blanche L. died Aug. 28, 1885 AE 1 Yr. 3 Ms. 19 Ds. Hulda H. Wife of Latham Hyde Died Dec. 26, 1859 AE 75 Y's. She has gone though not forgotten. He rests from his labours Asa E. HYDE Died Apr. 26, 1881 AE 63 Y'rs. & 8 Dys. She rests from her labours Wealtha MARTIN Wife of Asa E. HYDE Died Feb. 18, 1900 AE 83 Y'rs. 10 M's. Sarah A. daughter of Asa E. & Wealtha HYDE Died Aug. 11, 1885 AE 5 yrs. & 11 mos. Helen J. Daughter of Asa E. & Wealthy (sic) HYDE Died Aug. 18, 1860 AE 3 yrs. & 10 mos. Mary J. Daughter of H. & A. HYDE Died July 6, 1860 AE 16 ys. 5 ms. & 16 ds. William A. son of A. & M. HYDE died Aug. 11, 1860 AE 13 y. 4 m. 12 dys. Louisa T. daut. of A. & M. HYDE died July 16, 1862 AE 9 yrs. Buel H. MAN Died Aug. 30, 1886 AE 82 Y'rs. 13 D'ys. In Memory of Polly, wife of Buel H. MAN, died June 9, 1833 Aged 30 years. Louisa 2nd wife of Buel H. MAN Died Sept. 24, 1878 AE 67 Yrs. 6 Mos. & 17 Dys. Gen. Alric MAN Died Mar. 11, 1849 In His 77th Year. Widow and seven Children to regret his loss. In memory ofMrs.Suky (sic) Wife of Albon MAN who died Aug. 18th 1809 AE 33 years. Hannah Lou Daughter of A. & L. S. MAN Died Jan. 8, 1872 Aged 3 yrs. Samuel MARTIN died Apr. 3, 1856 AE 81 y'rs. bliss, without a sigh of regret. Aritta Consort of John PHILIPS Died Mar. 10, 1833 Aged 52 yrs. Albert Died June 16, 1833 AE 26 yrs. Nathaniel PLATT Died Mar. 8, 1858 AE 74 yrs. Son of Capt. Platt of Plattsburgh, NY. Hannah Wife of Nathaniel PLATT (NOTE: The rest is now buried too deep to read.) Died September 15, 1870 AE 83 yrs. Danielle Nicole PLUMADORE Aug. 25, 1979 - Aug. 26, 1979 Now I lay me down to sleep. Ebenezer P. POOR Died Dec. 30, 1833 AE 28 yrs. Bithiah Wife of Ebenezer P. POOR Died March 14, 1881 AE 75 y'rs. & 8 m'os. & 14 d's. And all his Jewels number. Frankie H., Son of George P. & Kesiah A. POOR Died March 5, 1879 AE 14 y'rs. & 19 d's. Alonzo RHOADES 1840 - 1911 Co. E 98 Reg. N.Y.S. Vol. Eunice Wife of Charles RINHART Died May 25, 1882 Aged 32 Y'rs. Gone but not forgotten. Abner C. SHERWIN Died Jan. 25, 1867 AE 58 y'rs. Jonathan SMITH Died Dec. 22, 1856 AE 86 yrs. Polly Wife of Jonathan SMITH Died Mar. 11, 1871 AE 95 Yrs. 1 Mo. & 4 dys. Elias Fitch Son of G. & L. I. WATERMON died July 3, 1846 Aged 17 m's. Jane Wife of Thomas WOOSTER died Aug. 24, 1848, AE 24 y's. 1 m'o.